Create a sleek, polished finish with the BaByliss Big Hair Care Hot Air Styler, an innovative heated brush tool that rotates to deliver a professional-quality blow dry. 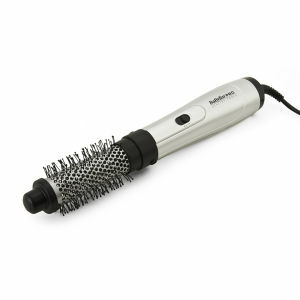 The soft bristles are spaced in regular intervals around the ceramic barrel, allowing them to gentle detangle and smooth locks whilst providing ionic frizz control. Sensor Protect™ technology ensures the heat is spread evenly over the barrel to prevent strands from drying out, and the three hot and cold settings allow you to create your ideal look. Expect shiny, bouncy and salon-worthy results. A protective shield is included to keep your styler at its best. Ensure the hair is 80% dry and combed through to remove any tangles. Divide the hair into sections. To turn the appliance on, slide the switch to the heat setting suitable for the hair type. Place the brush underneath the hair section close to the scalp and hold for a few seconds to boost volume at the roots. Use the brush to lift the hair at the roots as you dry. Move the appliance down through the hair and start to rotate the brush away from your head by pressing and holding the appropriate rotation button. As you do this, resist the rotation of the brush by pulling the brush downwards. This will create tension through the section of hair. IMPORTANT! It may take several attempts to perfect this technique, if the brush spins too quickly, simply release the rotation button and remove from the hair. 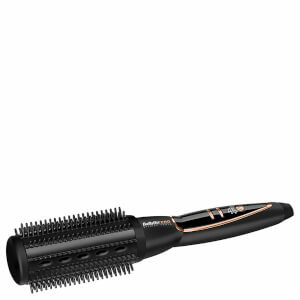 As you reach the ends of the hair section, continue rotating the brush to roll the ends under. For even more volume, place the brush at the end of the hair section and allow the brush to rotate along the hair section by pressing and holding the appropriate rotate button. Wind the entire section of hair around the barrel until you reach the root. 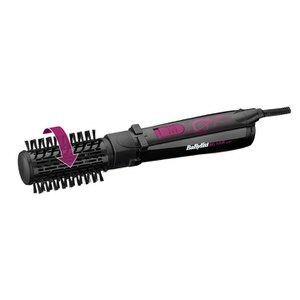 Release the rotate button and then hold the brush in the hair for a few seconds. Repeat as necessary. After use, switch off and unplug the appliance. Allow to cool before storing away. Place protective shield over brush head to protect the bristles.